New Cabinet at Government Buildings. 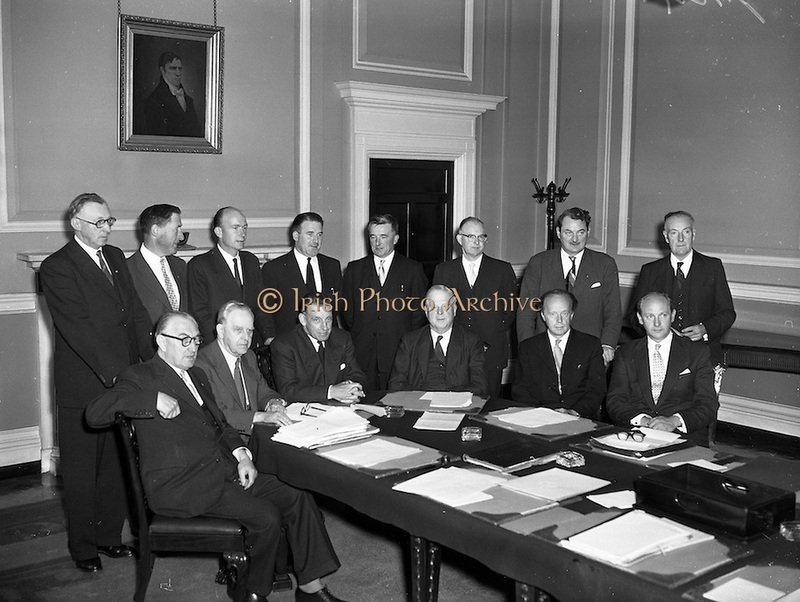 The new Cabinet photographed at their first meeting at Government Buildings, seated (l-r): Oscar Traynor (Minister for Justice); Sean McEntee (Tanaiste and Minister for Health); Sean Lemass (Taoiseach); James Ryan ( Minister for Finance); Erskine Childers (Minister for Lands); and Jack Lynch (Minister for Industry and Commerce). At back (l-r): Donnachada O Briain, Parlimentary Secretary to the Taoiseach; Neil Blaney (Minister for Local Government); Dr P.J. Hillery (Minister for Education); Kevin Boland (Minister for Defence); Michael Hilliard (Minister for Posts and Telegraphs); A. O Caoimh (Attorney General); Michael Moran (Minister for the Gaeltacht) and Maurice Moynihan (Secretary to Government). Note: Frank Aiken (Minister for External Affairs) and Paddy Smith (Minister for Agriculture) absent.